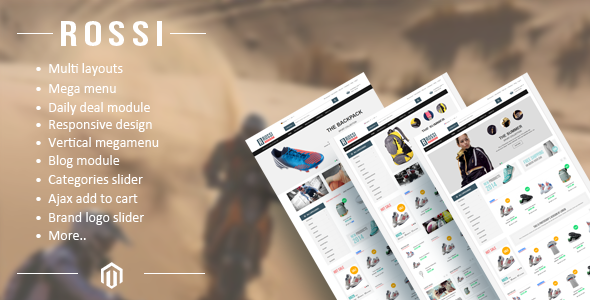 Rossi is an responsive multipurpose Magento theme for your online sport store. When you see this exclusive Magento Theme, you will be attracted and loved it. Multi Colors: 6 multi colors styles available multiple choices. Multi Language: Work with any language installed in your theme. Responsive Design: Adjust to fit all screen and device resolution. Vertical Mega Menu: Custom mega menu on vertical navigation. Top Menu Category: More useful search with category or subcategory search. Bootstrap3 + CSS3: More tight and logical with new bootstrpa3 and CSS3. Dynamic Layout: Columns, modules and blocks are arranged dynamically. Featured Product Slider: Show products which are featured in slideshow. Product Tabs: Product sliders from different categories displayed in different tabs. Custom Banner Slider: Display custom banner promotions in slider. Brand Logos Slider: Display manufacturer or client logos in slider. Ajax Navigation Layered: Optimize and improve navigation of your store. Ajax Add To Cart: Quick and convenient shopping with Ajax add to cart. Item Reviewed: ROSSI New Responsive Magento Theme 9 out of 10 based on 10 ratings. 9 user reviews.